BSpoke Design has the facilities to produce metal planters up to 3m in length and specialise in fabrication of most materials. Our Metals Planters are the idea way to give your garden the stylish designer look. We pride ourselves in manufacturing high quality yet affordable metal planters for both domestic and commercial projects. From a single planter to a complete theme we can supply to suit your exact needs. Please have a look just some of the materials we can work with. We also stock an extensive range of Metal Planters including Galvanised Steel, Stainless Steel, Powder coated, Mild Steel, Aluminium, Zinc, Copper...We can also manufacture complex shapes such twisted planters and tapered planters. We are able to supplied cube planters, barrier troughs, tree planters, window boxes, tall planters, circular plant containers and large troughs at an affordable price. Our galvanised metal planters are perfectly suited to both tall stalked plants and also shorter plants with dense foliage. The powder coated planters are perfect to add a splash of colour or to use classic grey, white and black tones to create planters which blend well with any plants. CorTen Steel Planters have many uses in garden and landscape design. It has an organic quality that evolves as the steel begins to weather to form a beatuful rustic patina over time. 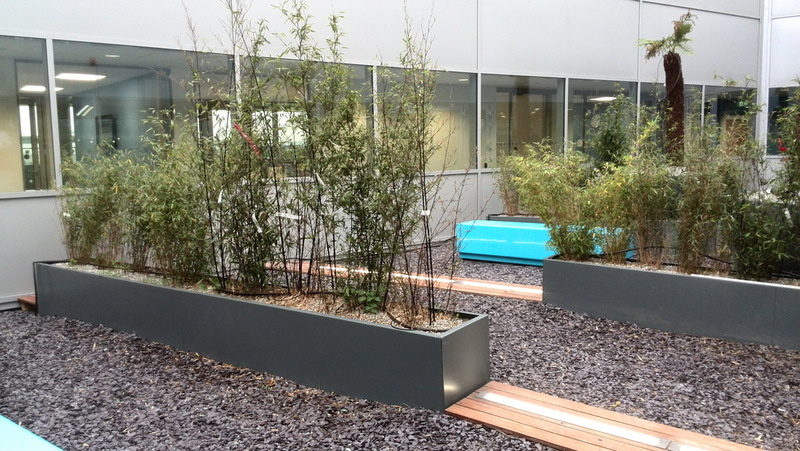 Our Stainless steel planter range, available in standard and marine grades and in both polished or brushed finishes. A popular choice of planter for both exterior and interior use to form a contemporary modern look and feel which extremely durable and rustproof in all climates.